CrossFit or HIIT circuits for ‘Strength & Conditioning’…Really? First off don’t get me wrong I am not a CrossFit basher. I actually like the idea of CrossFit and think it is great for those who choose it as their sport, and I have many friends who have indeed taken up CrossFit after they have retired from competitive sports. They see it as a way to continue the competitive drive and the longing for hard physical work and if it fills that gap….Brilliant, once coached properly then long may it continue for those people. And Crossfitters themselves are incredible athletes in their own right. However, that being said, when I heard this week of numerous local teams who are down the local box gym for their S&C sessions..and even hearing of two county GAA teams employing the same training methods, not to mention seeing videos of boxing teams and a rugby team on social media hammering out this type of HIIT, high repetition training against a clock it really seems to be fast becoming a worrying trend. And although I don’t want to be negative, I felt compelled to write this post. Why do we do S&C? Bottom line…..To improve in our field of play, end of. Strength & Conditioning is a buzz term at the minute with every gym offering ‘classes’ in it. And they are dead right and I have no issue with it whatsoever. I’d do exactly the same myself if adult general population was my area of interest. If the session or ‘class’ has an element of strength work and an element of conditioning then who am I to say it’s not strength and conditioning. Nobody owns the term. However, to Sports Strength & Conditioning coaches who work with teams or athletes the term has a very different meaning. It is a very carefully managed process through which they prepare athletes to be in peak physical condition to perform to the best of their ability and avoid injury. And this is not done in one class or session or indeed one venue. Keep conditioning where it belongs. In sports most of the conditioning is and should absolutely be done on the field of play or ring or court etc. Conditioning is specific. Swimmers are different to boxers; rugby players are different to soccer players etc. Have you ever seen an incredibly fit soccer team go to a boxing club and spend two rounds on the heavy bag? They gas out pretty quickly. Why?….because their fitness levels are within the demands of their sport and importantly that’s all they need to be. Why would soccer players need to punch for 3 minutes solid? They don’t….so any time spent doing that is wasted time and/or worse extra physical loading, adding to fatigue levels needlessly. If you are conditioning on the field of play sufficiently and correctly then you don’t need any other conditioning. Except of course when coaches/managers decide to throw in a week or two just doing something different for a mental break whilst maintaining activity levels and that is fine and even beneficial. Long term however, adding further needless conditioning away from regular sport training sessions can lead to fatigue and even injury. The time spent doing high repetition, under fatigue circuits such as those we see all the time in box gyms is far better spent working on another area that will actually make you a better performer when it comes to field sports. Namely; strength training. Leave the conditioning stuff where it belongs. Strength Training Deserves Stand Alone time. CrossFit and other high intensity circuits tend to be a mix of various weightlifting exercises done for repetitions and against a clock combined with conditioning work. One would assume that because you are lifting a weight you are going to get stronger? Yes probably,… initially if you have never entertained strength training before. However, to make real gains in strength then rest between each set of exercises is key. Each set of repetitions should be undertaken fresh and ready to lift each rep with maximum intensity. Only then can the nervous system recruit as many muscle fibers as possible to illicit the strength gains needed for sports performance. Sticking skipping and rowing or wall balls in there in between reps will only fatigue the athlete resulting in less recruitment for the next set and worse still sloppy technique resulting in injury. Bottom line; keep the gym for strength and the field for conditioning. The interval circuit type work might look good and make you tired but the mix it offers and the manner in which it is applied will optimize neither strength nor conditioning for sports therefore it is wasted time…unless of course your sport is CrossFit. Use exercises for the purpose they are intended. The demand that someone perform various Olympic lifts or complicated exercises such as burpee box jumps repeatedly for high reps against a ticking clock especially under fatigue is a recipe for disaster. The job of a strength and conditioning coach is to try to prevent injury not prescribe it. A lot of these box gyms programs are based on circuit type training were sets of lifts are interspersed with conditioning work then back to reps again. And that’s genuinely fine but when those lifts are complex power or Olympic lifts then the risk of injury sky rockets. Now I’m not against Olympic lifts and indeed I use them in programming for athletes, however when coached and used properly they are designed to increase our rate of force development in order to maximize our power. They should be done fully recovered and with as much vigor and aggression as possible for a small number of reps and this is not possible when you are fatigued from racing through a circuit. Therefore you will not achieve the desired outcome. Yes you will get good general conditioning, and you might even build some muscle but you will not maximize your power which should be an athlete’s main reason for doing them in the first place. Beware of differing cultures and goals. A lot of box gyms whose programming is based on intense circuits come with a culture attached, which is really good and it can be very motivating. However in those gyms where the paleo culture and carb minimizing to get aesthetic results are prevalent then be aware that this can be detrimental to performance on a sports field. An athlete’s goal is not the same as most who attend these type of classes. As field sport or other athletes the goal is performance in our field of play. And any culture where restrictions to diets apply, especially carb restrictions, will ensure you perform worse on the field. Carbs are the driving force for intense bouts demanded by most sports. Triathlon and other steady state sports (although research is in its infancy) can possibly get away with carbs restrictions and focusing more on keto derived energy from fats but where the gas has to be turned on quickly and regularly for a prolonged period such as a match or fight then carbs are a must. Especially fast releasing carbs (eaten around training and competition) such as breads and pasta, too often frowned upon by a lot in the high intensity gym community who prefer to restrict them in order to keep calories under control to get the athletic look for their clients. And this is fine because that is what many are paying their membership for but as an athlete playing sport your goal is and should be different. There are of course really good box gyms, just choose wisely. Now of course there are exceptions to the rule and I am being very general here based on what I have seen and heard recently. I do know some very good coaches many of them CrossFit athletes themselves who operate these type of gyms and they are very quick to tell athletes who are competing in different sports that they are wasting their time with these mix type classes and either offer them a different class when they are focusing more strength and power development or point them in the direction where they can find it. Be very aware of the gym and trainer you choose. 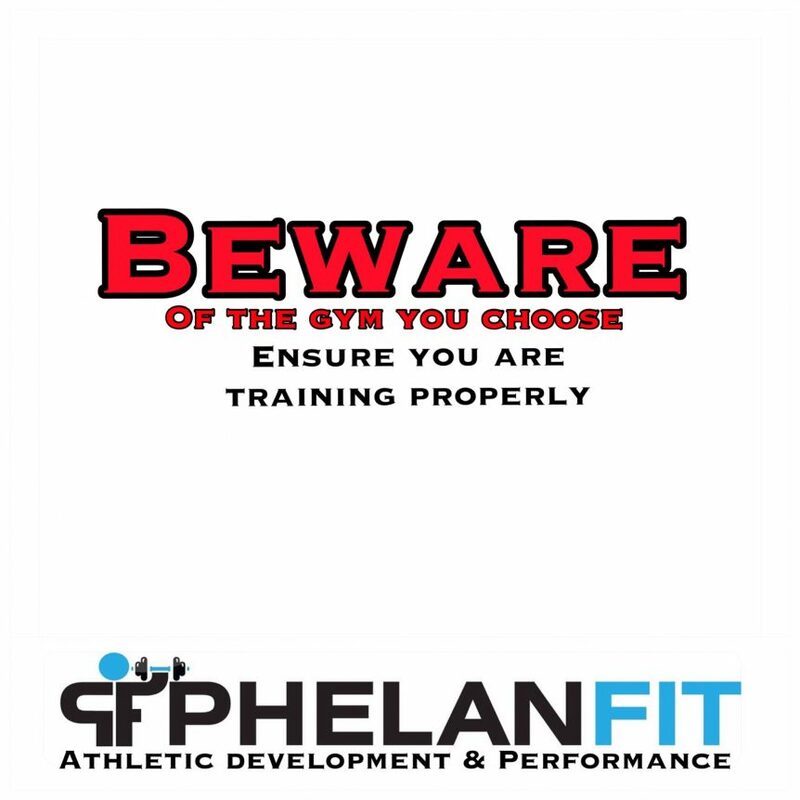 If you are in a gym and have told them you compete in a sport, train twice a week and compete once a week or more and they say ‘welcome join in the class’ and start doing any of the previously mentioned madness then walk away very quickly… Or indeed…If your entire team goes to a gym and the trainer starts getting ye to do all this conditioning work, mixed with high repetitions and is shouting down the clock at the top of their voice, then jump ship, you are wasting your time, compromising your ability to perform and even putting yourself at risk of injury. The demands that sport makes on our time is already large enough so ensure you are using it wisely. At the very least ask questions of your trainer, why this? and how will it help me? For some tips on strength training for sports have a read of my Training in the gym for Sporting Performance blog post. Alternatively click the link below to inquire about online programming.